Chicken Invaders 5: Halloween Edition is rated 4.0 out of 5 by 6. Rated 5 out of 5 by freeway34 from Awesome I stumbled upon this game, it's not something I would normally go for. There are so many HOG's on this site I wanted to try something different (getting sooo fed up of HOG's) I tried the "Chicken Invaders 5 Cluck on the Dark Side" 1st, thought it was alright, don't know why but it didn't quite grab me, so thought I'd try another I am sooo glad I did, I absolutely LOVE this Halloween Edition. I won't go into details as others have described it much better than I can. But one feature I really do like is the game changes orientation, this game is so much more than your normal space invaders. Give it a demo... if you don't like it demo a different Chicken Invaders I'm sure there's one out there for everyone. Rated 5 out of 5 by Pearly11 from This shooter is awesome! Wow! I just finished the trial and feeling thrilled. This a shooter and it reminded me of a Space game I used to play in an arcade, when a game console with only one game needed its own room. You can choose between the arrow keys and the mouse to play this game. I prefer the mouse. However, after a while it did hurt my hand and lower arm a bit. Probably a sign of middle-age and lack of fitness or maybe a mix between both. The game is very fast paced and it took my a few 'game overs' to figure out when I can collect to boost up my space ship and what I should better avoid. The music is very Starwarsy and dramatic. I really love the game and will purchase it. It makes a nice change to the usual games I play (HO, Strategy, Puzzle, Large File) and it really is a no-brainer and a good way to get rid of frustration. Just fire away and fry the chickens from the Henterprise with your laser guns. Rated 5 out of 5 by odle5 from Time to defeat the Coo Clucks Clan Yes, it is exactly like all the other chicken invader games but it is so much fun to take on the chickens in their little ghost outfits. Taking a fork is much like taking an arrow to the knee in other games. They changed the theme to a Halloween one but the only thing scary in this game is that there are now double forks that the bosses use to attack. Tombstones fly over and you have to shoot them down to get those bonuses. I love all of the chicken invaders games and own them all. 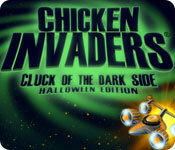 Yes, it is almost exactly like Chicken Invaders, Cluck of the Dark Side but I still love it!! Gotta go and take down some chickens! Rated 5 out of 5 by pennmom36 from Time For Some Chicken Soup! Have you ever played one of those games that are so frustrating you cannot stop playing it? This is one of those games, 5 starting lives isn't enough, so you find yourself starting over and over, learning from your mistakes as you progress just a little further each time. Just like the original space invaders, you must defend your planet from space invaders, which in this case are vicious Chickens! 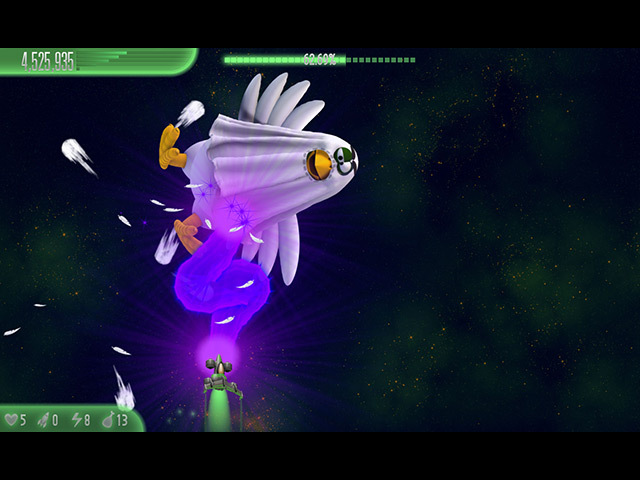 (some are dressed in Halloween costumes)The Chicken invaders have unique weapons and defenses, the hens lay eggs that will completely obliterate your spaceship should you take a direct hit or even if you mistakenly broadside a falling egg. When you blast the full grown chickens, they will reward you with delicious chicken legs and even whole roasted chickens, which can only be collected when your spaceship runs over them, which isn't always easy when the egg bombs are everywhere! There are also keys to collect, burgers, presents and weapon upgrades to snag. 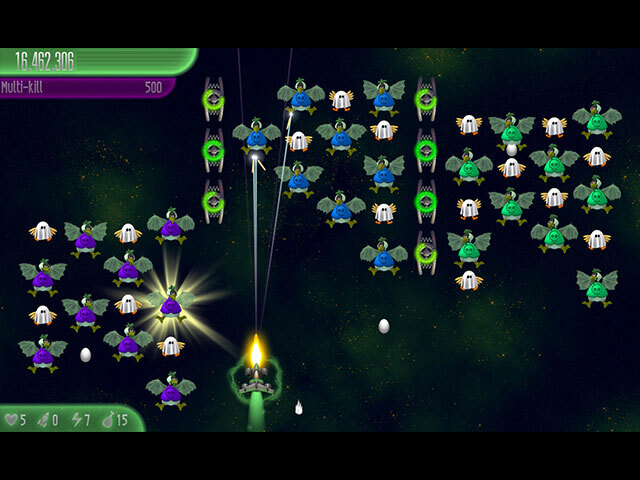 There are several achievements available and a high score leader board that will list all of your top scores (and the scores of other players on your computer) The options are vast, starting with the fact that you can choose the method you want to use to control your spaceship and weapons, your keyboard, your mouse, and even TOUCHSCREEN! The best feature in my opinion, is that you get to customize your spaceship with the keys you collect during the game, as well as backgrounds from previous versions. For starters, you will choose the base color of the spaceship, the color of the cockpit, and the color of the engine flames both inner and outer. There are several colors and shades to choose from and you will unlock paint options for the fuselage, the weapons pod, the tail wing, and even the density and shininess of the spaceship! In my opinion, this is a very addicting game that would be awesome on your phone as well. The graphics have come a long way since the days of Space Invaders, not to mention the fact that the mouse has greatly improved our ability to control the spaceship. Give it a try, but be warned, you're gonna get hooked on this comical chicken invading game, enjoy! Rated 3 out of 5 by metuttle from Just a repackaging of Chicken Invaders 5 If you haven't played CI 5, than this is a fine game, but if you have it's just the same game with different costumes on the chickens, nothing new in the adventure. Rated 1 out of 5 by sabinesa from Original is a definite 5 star, this is just a nasty quick way to make extra bucks Disappointing. I love the Chicken Invaders Series and this 5th one is absolutely outstandingly great, except this Halloween Edition isn't doing anything for me. With both the third and forth one I bought the Easter Edition and in each the changes were fun and added to the game play. Not so this one, just the little chicks as ghosts and the boss levels with a different look, like a skeleton and not even nicely done. Nae, expected more from the makers of one of the greatest shooter games ever. If you don't have the fifth one yet, rather buy the original, as this one doesn't even offer the original look as an Unlockable. If you got edition 5, don't bother, unless you are desperate enough to start your scoring from scratch and then the cheaper option would be to wipe your existing scores from the original. 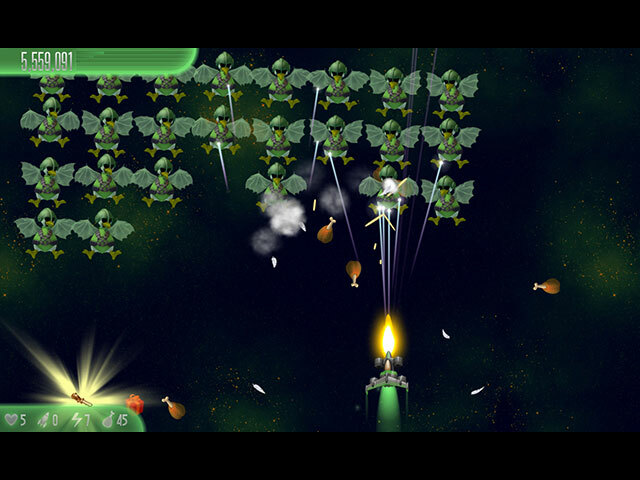 Definitely recommend Chicken Invaders 5, but don't recommend this Halloween Edition -> boring!